When you talk about fan engagement activities at football games, there are some common activities that you hear about quite often. Many of today’s most popular fan engagement strategies take advantage of recent technological innovations to impress fans with high-tech presentations they may not have seen before. Virtual reality engagements have become very popular, because they are so effective at getting people talking and sharing on social media. There’s the panoramic fan cam, which snaps pictures of the crowd at key moments and allows fans to download photos from the section where they were seated. There are mobile games where fans scan QR codes at various points inside the stadium to unlock special offers inside a mobile app. But when is the last time that you heard about a fan engagement activity that casts technology aside and encourages fans to return to the important cornerstone of human interaction and human emotion? We recently learned about one such fan engagement effort at the University of Iowa – and we liked it so much that we wanted to share it with you here. The Iowa Hawkeyes have done some impressive work over the years. In a Big Ten Conference that is packed with powerhouse teams like Nebraska, Michigan, Penn State, Ohio State, and more – the Hawkeyes have won the conference championship eleven times. They’ve inducted 14 people into the College Football Hall of Fame, and they won a National Championship in 1958. But right across the street from the Hawkeyes’ home in Kinnick Stadium, their colleagues from the University of Iowa Health System are doing some work that is equally impressive, and certainly more important. The University of Iowa Stead Family Children’s Hospital is the only comprehensive children’s hospital in Iowa. And it’s a stone’s throw from the action every weekend at Kinnick Stadium. Over the past few years, the university funded a major upgrade to the hospital’s facilities – adding more than 500,000 square feet and vastly expanding its treatment capabilities. The 12th floor of the new Stead Family Children’s Hospital is called “The Rooftop,” and it was designed as a calm oasis wherepatients, staff, and families could go to get away from the hustle of the hospital. It was designed with floor-to-ceiling windows for maximum natural light, and filled with charming gardens, colorful accents, and plenty of places for people to rest, relax, and reflect. By design, the 12th floor offers a brilliant bird’s eye view of the playing field across the street at Kinnick Stadium. An unintended consequence of the design is that people at Kinnick Stadium also have a clear view of the windows up on the 12th floor. After the renovated hospital opened in early 2017, it didn’t take long for players and fans to notice that patients and their families were lining up along the windows every Saturday to watch the game and cheer for the Hawkeyes. And in this way, a new Hawkeye tradition was born. Now, at the end of the first quarter at every Iowa home game – fans, players, and everyone in the stadium is asked to stop what they’re doing and take a moment to give “a big Hawkeye wave” to the patients and their families who are watching from the 12th floor next door. 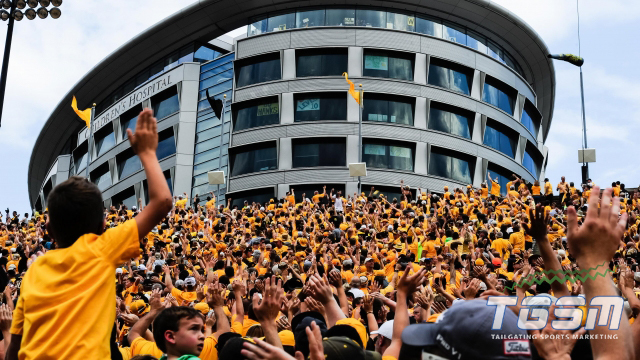 While we’re big fans of mobile technology and the new opportunities it has opened up for fan engagement activations – we think this new tradition at the University of Iowa is one of the best low-tech fan engagement activities we’ve ever seen. It provides an important source of inspiration and support for the children in the hospital, and it provides a positive, meaningful, and memorable fan engagement activity for the fans at the stadium. We’re on the lookout for some big developments in high-tech fan engagement this year – including augmented reality and on-field RFID. But a few wise teams and franchises will also harness the power of meaningful personal interaction like the “big Hawkeye wave.” After all, the goal of every high-tech fan engagement activity is to create emotion, engage the fan physically and mentally, and give them a memory they won’t be likely to forget. The Hawkeye faithful take part in just such an activity every Saturday when they show their support and encouragement for the children at Stead Family Children’s Hospital. 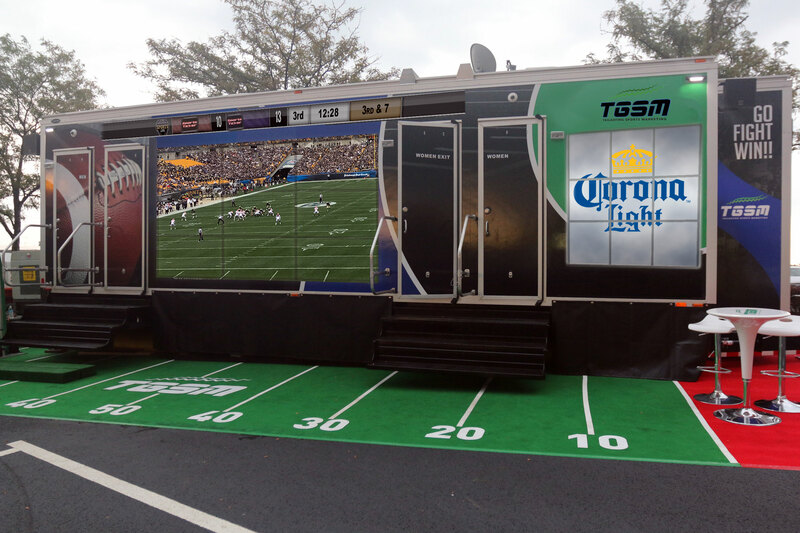 Our mobile fan engagement assets are designed to bring people together on tailgating lots and at special events. The community-building element of our design makes it a perfect complement for low-tech engagements that encourage emotion and personal interaction. However, each of our assets also has a rich high-tech feature set that makes it fit right in with the most sophisticated high-tech fan engagement strategies. We use a free, branded high-speed Wi-Fi network to draw in families and millennials, many of whom will remain within the activation’s footprint for the entire duration of the tailgating event. While people are at the asset, they have several inputs and activities to take part in together – many of which are tailored for maximum social sharing, like a brandable social selfie booth. And a vast array of interactive screens and sensors allows you to learn as much as possible about your target audience – including which messaging and imagery most resonates with them and holds their attention for the longest time. Inside each of our assets is a state-of-the-art full-service family-friendly restroom. It’s a far cry from the unpleasant porta-potties that fans are accustomed to. And it has demonstrated a profound and repeatable impact on the attendance of women and families at tailgating events. If you would like to learn more about TGSM’s mobile fan engagement assets, and how they work, please get in touch with us today at (888) 995-2285. Our assets can be seamlessly integrated into any fan engagement effort to facilitate community-building and personal interaction. And they’re also capable of integrating with the most sophisticated marketing technology in use today.